Indonesian search and rescue team on boat searches for a ferry which sank Monday at Tigaras port in Toba lake, North Sumatra, Wednesday, June, 20, 2018. 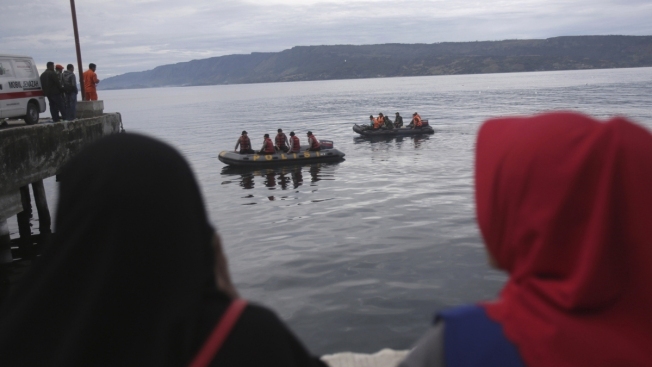 Distraught relatives slammed Indonesia's government for not enforcing basic safety measures on passenger boats and pleaded Wednesday for a bigger search effort for the people missing since a ferry sank on a picturesque Sumatran lake early this week. Distraught relatives slammed Indonesia's government for not enforcing basic safety measures on passenger boats and pleaded Wednesday for a bigger search effort for at least 178 people missing since a ferry sank on a picturesque Sumatran lake early this week. Associated Press writer Ali Kotarumalos contributed to this report.